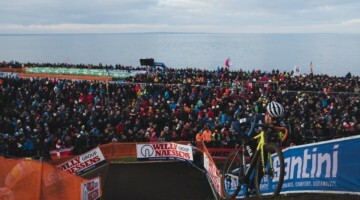 Ten years ago, Balint Hamvas started his career as a cyclocross photographer. Eight years ago, he produced his first cyclocross photo annual album that uses his photos and stories to tell the story of each international cyclocross season. 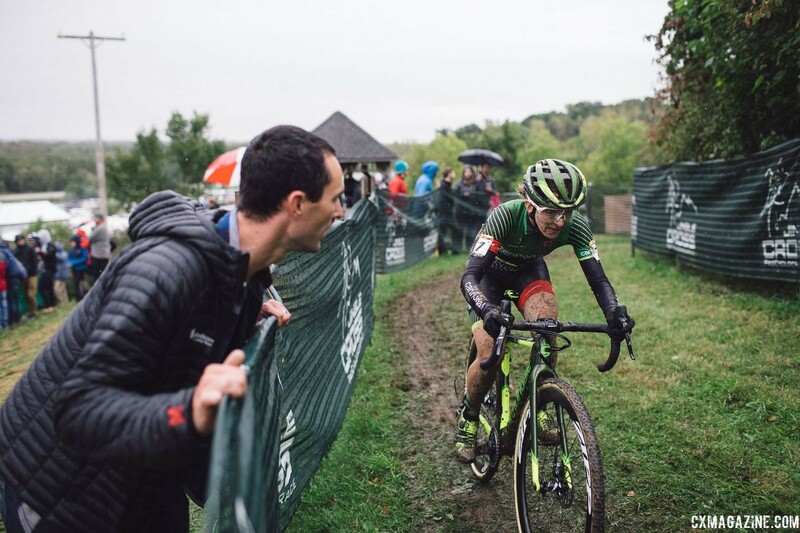 In this special 10th-anniversary album, Hamvas will not only look at the current 2018/19 season, but he will also take a look back at the last decade in cyclocross. We received a copy of Hamvas’ 2017/18 Cyclocross Photo Album that we included in our holiday gift guide, and we thought it was quite good, blending photos with stories to provide a yearbook of the year in cyclocross. We also did an interview with Hamvas about an earlier edition where we learned about how he has gotten to where he is. Right now, Hamvas’ Kickstarter for his special 10th-year photo album is open for support. Contributions above a certain level give you a copy of the 2018/19 photo album to be delivered this summer. For more information, you can visit Hamvas’ Kickstarter page. Also see below for a photo gallery of 2018/19 images from Hamvas. Hi, I’m Balint Hamvas and I’m the chap behind cyclephotos.co.uk. If you follow ’cross you might have bumped into my photography, you might have visited my site or heard about my cyclocross photo albums. Or you might have seen me at a race, wearing my outrageous waterproof waders. I’m a freelance cycling photographer, but my main love is cyclocross. 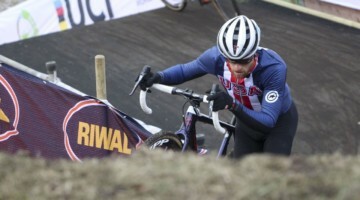 Originally, I’m from Hungary and up until 2008, I had no idea what ’cross was about. 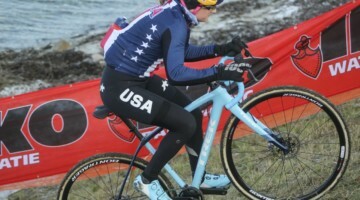 I visited a World Cup race that autumn and it was love at first sight. Since then, I have photographed close to 200 world-class races and I have produced eight photo annuals so far, including the previous one about the 2017/2018 season. The 18/19 edition of my book will guide you through the season my selection of high-quality photos, including my best shots from all the major European races as well as great articles written by well-connected journalists in the sport. However, in this year’s album, I will not only do the usual thing and bring you my best photos from the season, but I will also look back on the last decade. The sport has changed a lot in the last ten years and I want to reflect on that. I also want to take a look at where the sport is heading, as it feels we are at crossroads (pun intended). 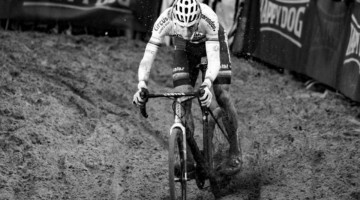 I will also talk about my personal journey, how cyclocross has changed my life. All this will only fit into a bigger book, so this year’s edition will be over 290 pages, a truly special edition. And as always, it will be 100% ad-free. As always, producing these books is a labour of love. It can be hard work pulling everything together, but at the same time, it’s always really rewarding and great fun. Thanks to all the support over the past years, I have been able to complete three successful Kickstarter campaigns in order to publish the 15/16, 16/17 and 17/18 editions of the book. This has been hugely encouraging and it gave me the confidence to try again this year. So, I’m asking for your help to make the book happen! Here is the deal: you pledge money for the book and hopefully, if enough people do the same I’ll hit the target, the project will go ahead and the books will be ready by July. Of course, as with all Kickstarter campaigns, if I don’t reach my target, you won’t get charged and unfortunately, the book won’t happen. I’m so grateful for all your support throughout the years. I know this album will be a great edition and I really hope, that with your help, we can make it happen! Thank you!